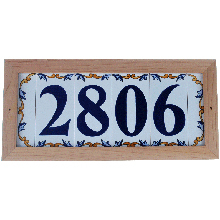 Our House Number Frame Collection allows you to install our beautiful ceramic house number tiles in an extremly low maintenace address plaque with easy installation. In our Frame Collection, we offer powder coated cast aluminum, copper and brass frames as well as cedar frames. 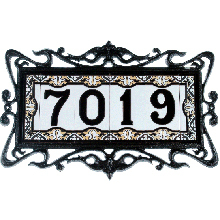 All of our address plaques can accommodate most combinations ranging from 1 to 5 numbers with trim, (decorative house numbers shown in the following plaques are sold separately). Select from the following collections by clicking on the image. Our beautiful natural Copper frames will not only stand the test of time, but will patina gracefully with age. The combination of maintenance free Copper, high fired ceramic tiles and easy installation will allow you to enjoy your elegant address plaque for many years to come. 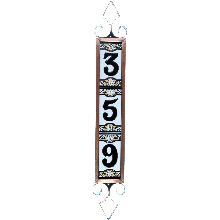 (Decorative house numbers shown above in frame are sold separatley). Our cast Aluminum Pearl frames are made for anyone who is looking for "Elegance", "Low Maintenance" and "Easy Installation". These powder coated Aluminum house number frames will make a statement for many years to come. 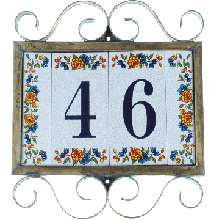 (Decorative house numbers shown above in frame are sold separatley). Our beautiful natural Brass frames will not only stand the test of time, but will patina gracefully with age. 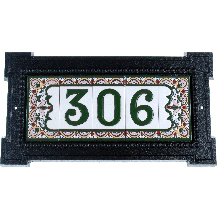 The combination of maintenance free Brass, high fired ceramic tiles and easy installation will allow you to enjoy your elegant address plaque for many years to come. 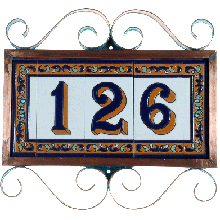 (Decorative house numbers shown above in frame are sold separatley).